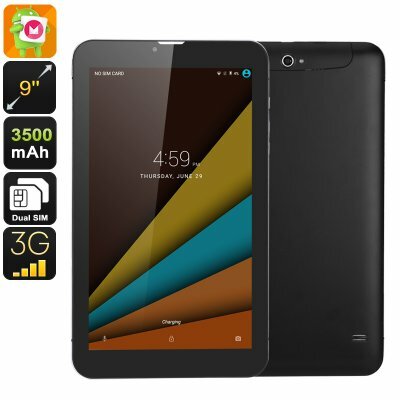 Successfully Added 3G Android Tablet - 9 Inch HD Display, Dual-IMEI, 3G, OTG, Android 6.0, Quad-Core CPU, 3500mAh, WiFi, Google Play to your Shopping Cart. For those of you that are looking for a cheap Android tablet, this 3G tablet PC is the perfect electronic gadget. Thanks to its highly affordable price tag, this Android tablet computer is great for keeping your kids entertained during the coming holidays. It features a large 9-Inch HD display on which it allows your kids to enjoy their favorite films and games. With access to the Play Store, this tablet computer provides them with access to an unlimited source of free entertainment. Whether you’ll be waiting in the back or your car, or simply at home – with this 3G tablet PC you’ll never have to feel bored again. This Android tablet comes with two SIM card slots and supports Dual-IMEI numbers. Thanks to this, you’ll be able to throw in 2 different 3G SIM cards and enjoy mobile network anywhere you go. Additionally, it also lets you use your tablet PC as a smartphone in case of an emergency. You’ll be able to call, browse the web, and send out messages no matter where you’re at. Along with its Android 6.0 Operating System, this electronic gadget will provide you with a smooth experience anytime you turn it on. Whether you use it to watch movies, play games, or browse the web – this tablet PC is sure to meet your demands. Within its sleek body, this cheap Android tablet packs some sophisticated hardware. Its Quad-Core CPU brings forth enough power for you to enjoy basic Android applications and software features. Along with 8GB of internal memory and a 32GB SD card slot, there will be plenty of space to store your media. Its powerful 3500mAh battery provides you with several hours of continuous usage time. Thanks to this, your tablet PC will keep you entertained throughout the day. A 2MP intergraded camera even allows you to shoot video and snap pictures of all that’s happening around you. This 3G Tablet comes with a 12 months warranty, brought to you by the leader in electronic devices as well as wholesale electronic gadgets..